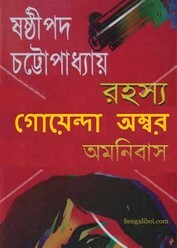 'Rahasya Goenda Ambar Omnibus' is a collection of detective short stories and all these are written by by Shashtipada Chattopadhyay. Goenda Ambar is an extraordinary detective character, the character created by this author who well-known for writing intelligence stories. Goenda Pandav is another popular detective figure of his creative. He also wrote many mysterious, adventure, horror, travelogue stories. Today's sharable book has seven Goenda stories in two covers. The ebook pdf has 116 quality pages, 6mb file size.